The success of your yogurt shop relies on serving superior products. Nanci's dry mixes provide the highest quality ingredients, including pure crystalline fructose. With over 25 years in the frozen yogurt industry, their 100+ base flavors offer over 200 exciting flavor combinations! Nanci's dry mixes are far easier to store and use than liquid mixes. Water is all you need to create a creamy taste and texture that has been proven through a blind taste test to be equal or better than liquid mix. Dry yogurt mixes also cut the cost of refrigerated shipping and storage. Save money without sacrificing quality! Instead of table sugar or the dreaded high-fructose corn syrup, Nanci's uses crystalline fructose, which is the natural sweetener found in fruits and berries. It is 75% sweeter than table sugar, so less is needed, reducing calories and carbs. A Stevia sweetened yogurt mix is also available for your sugar-free needs. Live active yogurt cultures set frozen yogurt apart from ice cream. Nanci's dry mixes use an encapsulated yogurt culture called Lactobacillius Sporogenes that activates when water is added, retaining the live probiotic culture benefits of your product. Create over 200 flavor combinations of frozen yogurt through liquid concentrate that are stirred into the base mix before you pour it into the machine. Flavor bottles come in half gallon and gallon containers for your convenience. Rotate flavors to keep your customers returning again and again. Private label and custom formulation is available. 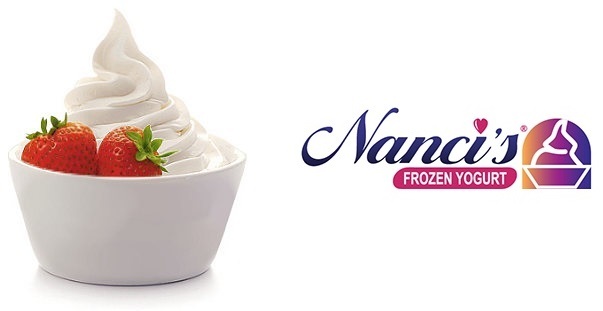 Start creating some frozen fun with Nanci's Frozen Yogurt!